Bath Bomb Suger Plum Fairy Gift Set. When you're nestled all snug inside your bed, with visions of sugar-plums dancing inside your head! Let the pure essential oils of this magical gift pack take you to a sweet sleep! All of Bomb Cosmetics products are mixed, pressed, moulded, rolled and shaped by hand. Not tested on animals. 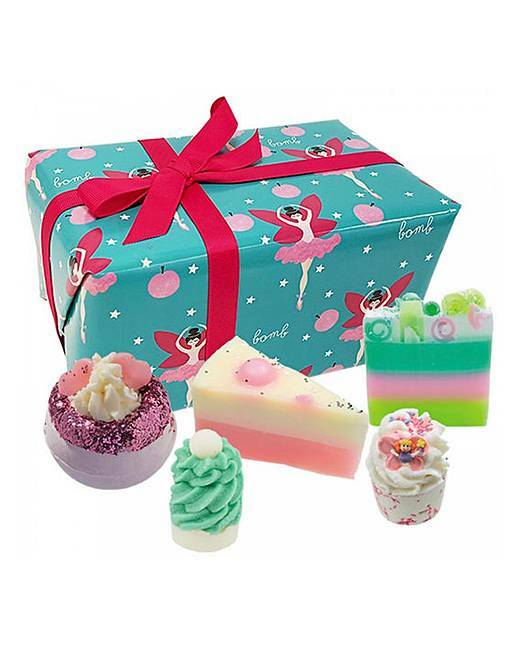 Gift Set contains: Sugar Plum Fairy Blaster 160g, Elf Indulge Mallow 30g, Sweet Star Surprise Soap 100g, Fairy Whispers Mallow 30g and Sweet Sundae Soap 100g. We aim to deliver your order within 7 working days, providing that the items are in stock at our own warehouse, or by the time indicated if being despatched directly from our supplier, larger items requiring 2 man delivery will be booked in for delivery by the carrier after despatch.